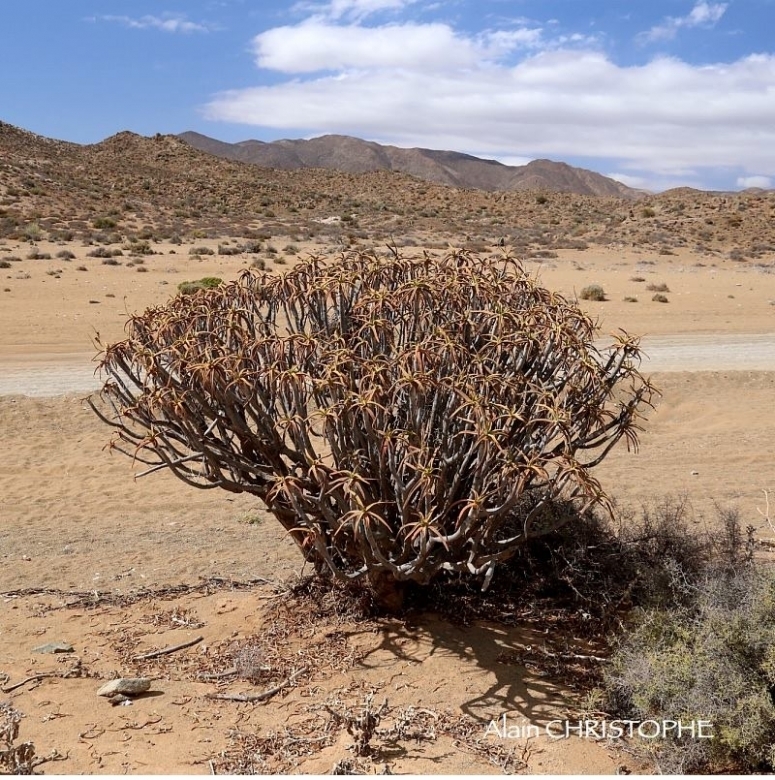 Origin and Habitat: Southern Africa (Richtersveld), southern Namibia. Habitat: The plants is from the winter rainfall of Southern Africa's Namib Desert and occur in very arid, rocky places on hills and mountains. They rely on winter rains that average around 110 mm or less per annum. It is not at all uncommon in this area for summer temperatures to rise to 46º C and years may pass before any rain falls. Ecology: The bright yellow flowers produce nectar which is harvested by sugarbirds and ants. Generally, flowers are pollinated by bees and ants. When capsules dry out, the winged seeds are carried by the wind, often landing in bushes where they germinate, making full use of the shelter and shade. Plants eventually outgrow the nurse plant, killing it in the process. The fleshy leaves and stems act as water reservoirs in times of drought and the grey powder on the stems reflect intense heat away from the plant. 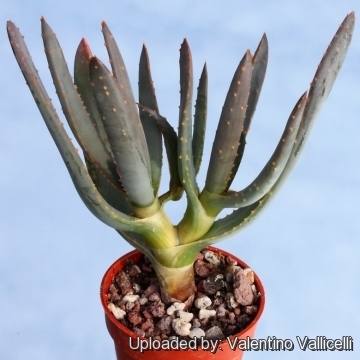 Description: It is a slow growing tree (shrub) type aloe known for its many branches and smooth, white stems, and without a doubt the most profusely branched of all aloes. 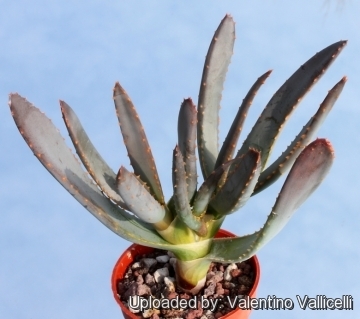 It will form a succulent bush up to 1,2(-1,8) m tall and wide. Other than this low branching habit and usually smaller leaf size, it is virtually identical to Aloe dichotoma, and some consider it a subspecies of A. dichotoma. Eventually forms large mounds. 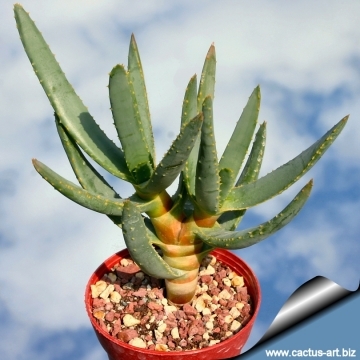 Stems: As mentioned before, this aloe forms many branches from the ground level. This is the only significant difference between A. dichotoma and A. ramosissima. Branching continues as the plant becomes older, resulting in a dense, almost spherical shrub. The trunk is normally very short smooth and covered with strips of satiny, waxy, powdery silver-pink-brown coloured bark, which acts as a sunscreen in the harsh climate. 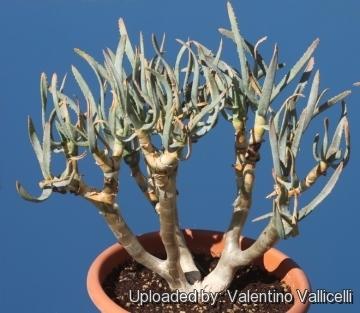 The plants tends to be longer-stemmed and less branched in more arid areas. Leaves: The branches end in small rosettes of fleshy, oblong leaves, each up to 200 mm long and 20 mm wide at the base. The leaf colour is glaucous-green or yellowish green, often with a pinkish tinge. The margins have narrow edges with small brownish teeth; base encircling the stem. Flowers: Bright yellow, comparatively large, tubular, conspicuous, swollen, fleshy on a usually 3-branched short inflorescence, up to 200 mm long. Blooming season: Winter: Definitely slow to flower, like Aloe dichotoma, takes quite awhile before it blooms, the first flower will be produced when plants gets 1-1,5 m of height (about 10 to 15 old). Fruits: Shiny and smooth dry capsule that split into three, remaining fused at the base. Seeds: Narrow, winged, up to about 30 x 18 mm. 11) Reynolds, G. W. 1982. "The Aloes of South Africa" ed. 4. Rotterdam. Cultivation and Propagation: Winter grower, it is sometimes a tricky grower and prone to rot. 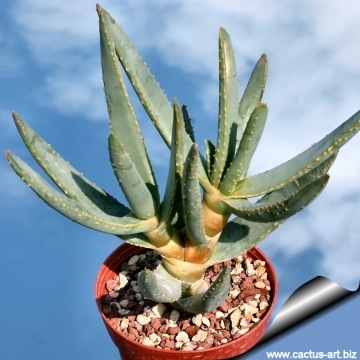 Like its closest relative, Aloe dichotoma, it has a very old and almost stressed appearance making this an excellent and sought-after container plant or wonderful landscape specimens in the garden, although it doesn't make a trunk. Growing rate: They grow slowly, but not agonisingly so – being able to increase their height by 10 - 20 cm per year under favourable conditions. They are long lived plants and once established, they will be content in their position and with their soil for years. Soil: Always use a good quality, loamy sandy soil with plenty of drainage chips at the bottom of containers. Potting: It is best suited to being grown in a pot around here so that it has excellent drainage. Watering: When growing this Aloe, one must be careful not to overwater. Hardiness: They can take a few degrees of frost in winter as well, but prefer hot summers. It grows much better outdoors in spring and summer. If kept dry it is frost resistant and without trouble.. Gardening and landscaping: In mild climates they can be cultivated outdoors for use in landscaping, preferably planting it in hot and dry rock gardens. They will grow best in regions with a climate close to that of their native deserts – not too cold, and not too wet. They can be grown in large containers too. 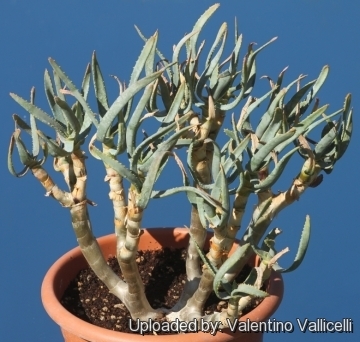 Other uses: Unlike Aloe dichotoma, there are no cultural or medicinal uses associated with the maiden's quiver tree. However, it is known that the very young flower buds can be eaten and taste a little like asparagus. The branches of this plant were used to make small quivers by young men who then gave these quivers to young ladies as a sign of their affection. Propagation: Plants grow easily from seeds and once germinated develop rapidly. It is possible to grow plants from cuttings but attempts are very seldom successful and therefore not advisable..The problem is they don't start to form roots until the start of the active growth season, which in begins in September. Seeds are able to survive for many months, but it is better to sow fresh seeds. Use coarse river sand mixed with fine compost, one part compost and two parts sand. Cover seed lightly and keep moist. One must be careful not to over-water and seedlings should be treated with a fungicide to avoid damping off. Seeds of Aloe ramosissima are best sown in autumn. Truncheons (if available) can also be used for propagation. Truncheons must be dried out for at least 3 weeks before planting in river sand. This is quite a difficult alternative and success is not always guaranteed.